Hyundai Motorsport has taken the i20 WRC out of the workshop and onto the road to start its testing program. Why is Hyundai spending millions of dollars on the new race car? Why should the average American be interested in what Hyundai is doing on the race track? Competition extends farther than the race track in the automotive world. With automakers competing for marketshare around the globe, any manufacturer who is going to compete needs to do it first on the race track. They don’t do it to get a trophy to put in the cabinet at world headquarters. Automakers do get valuable recognition around the globe from race fans who pay attention to who wins. Why is Hyundai spending millions of dollars preparing a race car like the new Hyundai i20 WRC? The race circuit is a demanding and very competitive environment. Hyundai Motorsport has just spent an intensive few months preparing the new i20 WRC. At its new headquarters in Alzenau, Germany, the i20 WRC has been taken out of the workshop and onto the road to start its testing program. But it’s more than just a race car. Hyundai like all serious performance automakers, will learn valuable information from the race car. They will use the technical information they learn and it will filter down to the cars we drive everyday. This will be key information they will learn about the new engine and chassis technology they are developing. Hyundai Motorsport is preparing the car to race in the FIA (Federation Internationale de l’Automobile) World Rally Championship in 2014. The testing has begun at the private testing ground near its Alzenau, Germany, headquarters and it’s just the beginning. The test schedule will ramp up big time in the coming seven month’s as they prepare for the first race at the Monte Carlo Rally in January 2014. This first testing of the Hyundai i20 WRC is already revealing good information. Hyundai says they encountering no significant issues with the new race car on the three-day, 550-kilometer shakedown. During the sessions, various set-ups were tried out and valuable data was gathered for analysis by engineers back at the Hyundai Motorsport facility. Hyundai is interested in winning, and all key areas of the car’s performance were evaluated. But a major focus for Hyundai Motorsports was on collecting feedback from the i20 WRC’s 300 hp 1.6 liter turbocharged engine. This valuable data is for the race season and also for production vehicles that will never see the track. 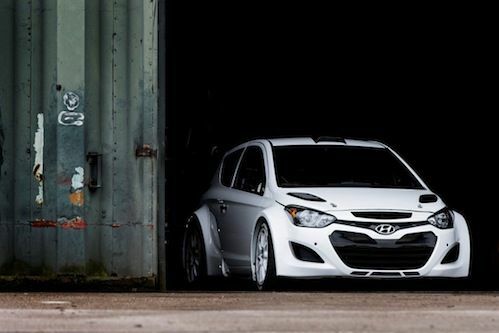 The Hyundai i20 WRC was designed at Hyundai’s Namyang R&D Center in Korea and is being made race-ready at the Hyundai Motorsport headquarters in Alzenau, Germany for the 2014 race season. But what takes place behind the scenes, is often more important than what happens on race day. Watch the Hyundai i20 WRC, very first presentation video.